AUTHOR: "INDIA IS NOW A PART OF WHO I AM"
Two factors prompted Chris Verrill of California to travel around the world and write "Is For Good Men To Do Nothing." First, he had the travel bug nipping at the heels. He just didn’t want to wait until he retired to see the world. 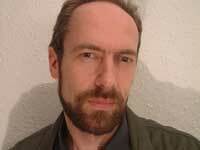 Second, he was at his Rotary Club of Pacifica (California) meeting on the morning of September 11, 2001. Together, the leaders of the small hometown of Pacifica watched the horror unfold on TV. The club decided to do something even before the second tower fell. Verrill took up a collection that morning even though he had no idea who to donate it to. He and his fellow Rotarians knew that a lot of people in New York and other parts of the world were going to need some help. So, he decided to personally do something about it. Not just make a donation but to personally make a difference. The result is a 427-page book, published by Seeds of Freedom in association with Xlibris and in strategic partnership with Random House. The e-commerce pioneer and graduate of University of California-Davis wrote the book in an apartment in India over the course of a year. 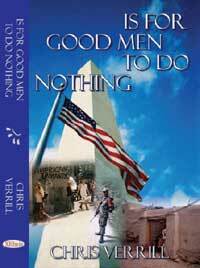 Verrill writes about his travels through five continents and 29 countries in "Is For Good Men To Do Nothing." The 42-year-old, whose academic degree has nothing to do with international volunteerism, is single, never married, no pets, no kids and one dying plant. "How else could I take off on a yearlong adventure?" he asks as he answers some of our questions. KhaasBaat: You wrote the book while in India. Why India? Verrill: I spent almost a year in Delhi. I wanted to find a place in the world where I could spend a long enough time that I felt, not just like a tourist passing through, but like a resident. I chose India because I thought, while I was writing the book, I would get a graduate degree in international relations from Jawaharlal Nehru University. That didn’t pan out, but I stayed in India to write the book anyway. India was both wonderful and frustrating. But it will always treasure the experience and India is now a part of who I am. 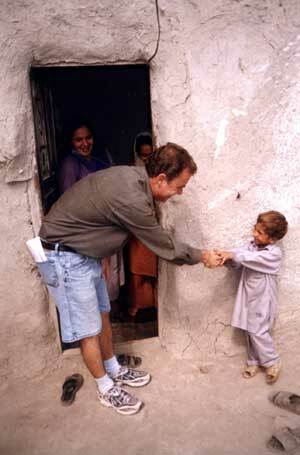 Author Chris Verrill shakes hands with a little boy in Khurasan refugee camp in Peshawar. KhaasBaat: How has the response been to the book so far? Verrill: The book was released just recently, so I don’t have a sense yet of what the world thinks of my book. The few critics I’ve sent it to have had mixed responses. Some thought it was insightful and witty and some thought I didn’t deal seriously enough with an important subject. Of course, that was my objective. I wanted to take a serious subject and make it accessible to the average reader. KhaasBaat: What part of your travels or places are the most memorable for you? Verrill: Talking with former freedom fighters in Afghanistan was memorable. Getting abducted by a crazy bus driver in Greece was a slapstick adventure. Getting interrogated by Israeli security because, in part, I spent time in Palestine was educational. KhaasBaat: What inspired you to come up with the title of the book, which indeed is very catchy? Verrill: I want this book to inspire everyone who reads it to make his or her neighborhood a better place. Whether their neighborhood is down the street or on the other side of planet is up to them to decide. No one has to solve all the world’s problems, but each and every one of us has a responsibility to solve at least one. When I was a boy and I went camping with my father, he taught me to leave our campsite cleaner than it was when we got there. Not just as clean. But a little bit cleaner. I apply that philosophy to life. If we all left our world a little bit better than it was when we got here, don’t you think the world be a better place? The title of the book is from Irish statesman Edmund Burke’s famous quote, “The only thing necessary for the triumph of evil is for good men to do nothing.” I hope the book inspires people to help each other. I’ve often said I don’t care if I make money from this book. But if just one person reads it and it makes a difference in the world, then it was worth writing. If President Bush reads it, he would learn a few things. KhaasBaat: What can the average American do to make a change in the world or raise an awareness of world happenings? Verrill: Americans are kind, generous, wonderful people. But we don’t get out much. Americans need to travel more. We need to understand the world better. The fact that Americans and the American media pay more attention to the Michael Jackson trial than the genocide in Darfur is inexcusable. We need to increase exchange programs. Not exchanges to London or Paris or Vancouver, but exchange programs to developing countries where Americans can teach more and learn more. Americans are under the false impression we spend a lot on foreign aid. Actually, we don’t spend enough. We need to make more investments overseas. Imagine if the mothers of those 19 hijackers had learned a skill or trade at a U.S.-funded vocational education program. Do you think September 11 would have happened then? Charity should begin at home -- but it shouldn’t end there. KhaasBaat: You worked in the Afghan refugee camps in Pakistan. Is there still a lot more work to be done in the Afghan refugee camps in Pakistan? Verrill: You can’t prevent a person from becoming a terrorist. You have to prevent them from wanting to become a terrorist. As long as people throughout the world have no hope and no education, then there will always be work to be done. The people of Afghanistan are still in the very early stages of rebuilding a country that has been ravaged by war for generations. The U.S. did an amazing worthwhile thing in using our military muscle to oust the Taliban. For that, the Afghan people are grateful. But they fear we will abandon them again; the same way we abandoned them after the Soviets were pushed out. That neglect on the part of America and the international community is what allowed the Taliban to come to power in the first place. Now, our neglect is allowing machine gun toting warlords to run rampant over the countryside. Aside from the city of Kabul, President Karzai’s Afghan government has no control. Without security, the Afghan people will not be able to rebuild. Just like Iraq, in Afghanistan we won the war, but we still haven’t won the peace. KhaasBaat: What next for Chris Verrill? Verrill: I’m going to spend my time sitting on a beach in China sipping mai tais. Actually, if I don’t find a real job sometime soon, I’ll be the one serving the mai tais! It would have been one of the greatest magical feats ever. But the Indian rope trick. never happened. Here's how it works or worked, for that matter: A rope rises into the air. A boy climbs the rope and when he gets to the top, he disappears into thin air. People expressed their amazement after witnessing the illusion, and pictures captured the stunning moment. Conjured by an amateur magician and printed in the "Chicago Tribune" in 1890, which admitted four months later that the story was false, the hoax spread like wildlife throughout the world. In his new book, "The Rise of the Indian Rope Trick: How a spectacular hoax became history" (265 pages, published by Thunder's Mouth Press), Scotland-based author Peter Lamont explains how the rope trick became one of the most successful hoaxes of all time and the reason so many people fell for it.